Evena Medical, a privately-held company operating out of Silicon Valley, focuses on delivering high-definition imaging technologies that target accurate and precise intravenous access. Evena's first successful product - the Evena OwlT, which visually identifies a patient's veins utilizing near-infrared (NIR) visualization - launched in early 2013 and is now available worldwide. As highly useful as the technology has been, early this morning, in partnership with Epson, Evena announced the next evolution (or revolution depending on your "point of view") of the technology - its new Eyes-On Glasses system, a breakthrough and truly wearable design that brings an entirely new vision (in both senses of the word) to vascular access. It is indeed, we believe, a very cool and exciting next step in medical technology utilizing wearable tech – and, by this, we mean technology that is ready to deploy. The Eyes-On Glasses System enables nurses at the bedside to see "through" a patient's skin to the actual vasculature system beneath it. By utilizing Evena's Eyes-On Glasses nurses, doctors and other clinical workers who need to tap into veins - especially those often hard-to-locate veins - will now be able to easily see and precisely access them. The Eyes-On system utilizes Epson America's Moverio smart glasses technology platform, and now represents one of the first true, "in the field" healthcare applications of smart glasses commercially available within a global ecosystem. We ourselves have certainly experienced the frustration (and occasional pain) that goes with trying to locate a vein - we can certainly be happy about this excellent use of wearable tech! Frank Ball, Evena Medical's president and CEO, underscores this in noting that, "Studies have shown that up to 40 percent of IV starts require multiple attempts to locate and access a vein, which not only wastes valuable nursing time but also delays therapy and often causes patient discomfort and dissatisfaction. With Evena's Eyes-On Glasses, nurses will quickly and easily locate and access the best veins for each patient - even within challenging clinical environments such as pediatric or neonatal units." The Eyes-On platform features a patented design that incorporates multi-spectral 3D imaging and wireless connectivity. It is a point-of-care system and is the first vein detection device to deliver clear, anatomically accurate, real-time imaging in a wearable, easy-to-use, hands-free and cart-free system (for those who wield those carts, we can imagine how much of an improvement the new tech will be). Evena's Eyes-On Glasses take things a step further than locating a patient's veins. The system includes digital storage to enable easy verification and documentation of vein patency throughout a patient's stay in a medical care facility, and telemedicine capability to share images remotely. The system also interfaces with hospital electronic medical records systems for seamless documentation. This level of integration - and accuracy both in the imaging and in the record-keeping - is important to the larger scope of healthcare capabilities that become available to patients. Anna Jen, director, New Ventures/New Products at Epson America, says, "It's extremely gratifying that one of the first healthcare solution concepts featuring Epson's Moverio smart glasses technology is one that improves both patient comfort and nursing efficiency. We are proud of what the Evena team has accomplished and look forward to working with them well into the future." 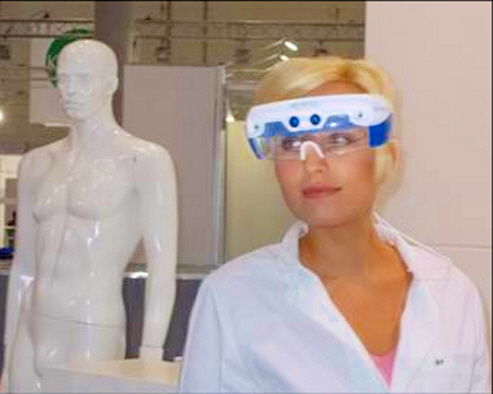 The Epson Moverio platform itself offers a unique binocular design that projects overlays of digital content onto the real-world in the center of the wearer's field of view. As a binocular system it delivers as well on 3D imaging capability. Enabling a seamless blend of the physical and digital worlds, the Moverio smart glasses help to deliver on a new world of exciting wearable technology applications for commercial enterprises and consumers alike. All in all the new Eyes-On Glasses technology and platform is a very welcome addition to the healthcare/wearable tech marketplace.